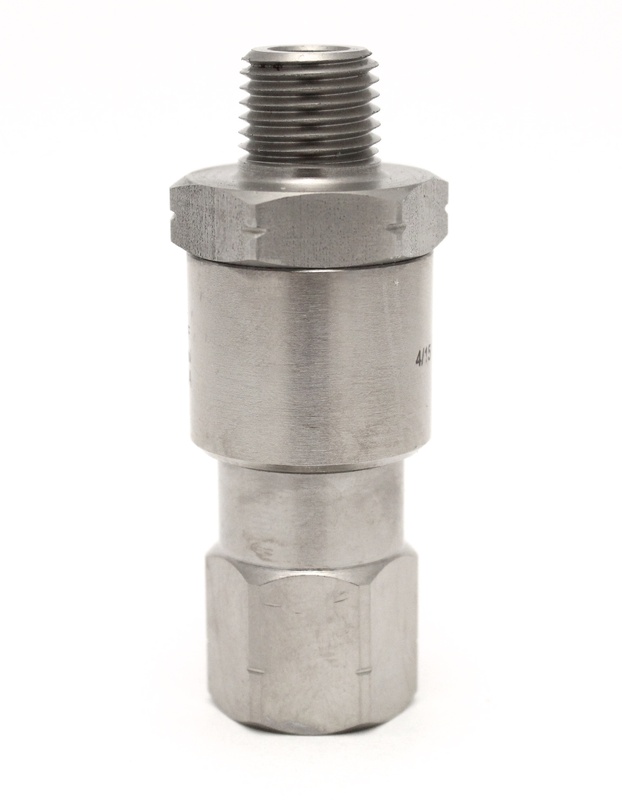 Hotsy High Pressure Gun Swivel | Hotsy Equipment Co. When pressurized, Hotsy hoses can be difficult to maneuver and keep kink-free. 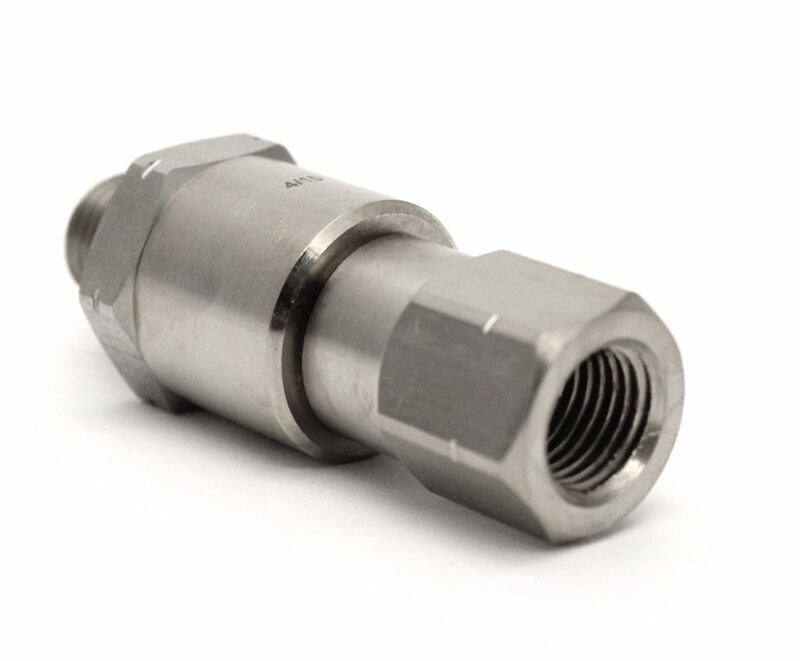 The Hotsy High Pressure Gun Swivel makes maneuvering a pressurized hose easier than ever. The High Pressure Gun Swivel allows for full 360º movement of the Gun Trigger while keeping the pressurized hose free from tangles and knots. I would like pricing for this product. I would like to schedule a product demo. I would like additional product information. We use our Hotsy for everything. We clean our semis, our trailers, our shop and all of our personal vehicles. It does it all. Our Hotsy is very reliable. We’ve owned four Hotsys over the years and we’ve only had one Hotsy serviced, once!" Hotsy Equipment Co.’s service is great. If there is a problem, from big to minor, they are right out. Their technicians are friendly and professional and they do great work." Our Cuda Parts Washer is very time saving and cost effective. Most places work through a 55 gallon drum of brake clean in 3-4 weeks. With the Cuda parts washer we go through brake clean in 3-4 months!" Before our Hotsy we had a different brand of pressure washer that we used to clean our trucks. Not only do we like the way the Hotsy performs, it has been virtually trouble free." Our Cuda Parts Washer works really well for us. It’s much better than a brush-solvent tank and makes things a whole lot easier when washing old parts." We use the Reznor Waste-Oil Heater to heat a 100’x80’ section of our shop. It does a great job and gets used quite a bit when the weather gets cold." Our Hotsy Pressure Washer is very dependable. It does a wonderful job. Whether we’re washing our car or tractor our Hotsy has a lot of pressure and the Hotsy Detergents we use are astounding. They really, really work." I am very satisfied with my Hotsy power washers; both the portable one that I have had for 18 years and the stationary unit that I have had for just a couple years. Excellent machines, very dependable." Power-Shine gets the crud off really well! We’re very happy with our Hotsy detergent." I purchased my Hotsy 795 in February of 2016 and I have used it every week since. It works great for washing my trucks and sanitizing my mobile kitchen." If there was a problem or I thought I had a problem, I just give a call in and they’ll have somebody out to get it fixed any time I need." When we built our new facility, the easiest thing and the most positive addition was our Hotsy Pressure Washing System. We can’t give enough credit to Hotsy Equipment Co. Our Hotsy works flawlessly." Everything’s there. All the features that you need. Once you turn the power on you’re ready to wash. They work great. I never have any problems with a Hotsy. I’ve had all brands. All kinds of brands. Nothing is better than a Hotsy. Its the best there is." Our Cuda Parts Washer gets used to clean way more than we initially imagined. All I can say is I’m glad we went with the bigger model!" Our salesman was intimately involved in the planning and installation process. He listened to our needs during the entire process. The wash bay was designed right and it works right. The entire layout works excellent." Our Hotsys are very precious to us. They're incredibly dependable and they're still running like new even after all the hours we’ve put on them." Our salesman always takes great care of us. When we call him, he is there and lends his expertise. We can’t ask for anything more." I've been looking at Hotsy’s for years and when I finally bought one, I realized it was the best pieces of equipment I’ve ever purchased. My neighbors are begging me to borrow my Hotsy and I tell them to buy their own. I won’t share because I love it too much!" Our Hotsy 900 Series is a great machine. It’s trouble-free and reliable. It does everything we need it to do to keep our firehouse clean." We live 100 miles away from the nearest Hotsy, yet our Hotsy rep. makes time to stop by and see if everything is working properly. Hotsy seems to always put their customer’s satisfaction first!" Hotsy’s Service Technicians are always there for us. If we have a repair of any sort, they’re always available and their turn-around is very short so we’re never without our Hotsy." Hotsy Equipment Co.'s service is excellent. Our service tech comes in and takes care of us. He’s able to work on our Hotsy Pressure Washer and our Reznor Waste Oil Heater. He does nice work. We couldn’t ask for more." Hotsy Equipment has always been there for everything I ever needed. I give a call and they’re there. If I run out of soap, my Hotsy sales rep. just drives by and drops it off. The service can’t be beat." We trust Hotsy’s Service Technicians to maintain and regularly check our machines. The techs keep us up and running with scheduled oil changes and machine check-ups that drastically reducing our downtime." I have 50 different things to worry about, daily. Hotsy’s Scheduled Maintenance is #1 in my book because I don’t even have to worry about scheduling a visit. They come out once every three months and do their job. When Hotsy says ‘We’re done!’ I know our pressure washers are set." We've been using Power-Shine ever since we bought our Hotsy. It seems like the more we use Power-Shine the easier it is to keep our trucks clean. We clean our firetrucks after each and every run and we rely on Power-Shine with each clean." Mark Rasmussen is a top notch salesman who not only gives you a good deal but also takes awesome care of you after the sale." Our Reznor works great in the winter months. That was really smart invention! It’s an excellent way for us to dispose of our waste-oil and turn it into energy." We truly appreciate the dependability of both our Hotsy Pressure Washer and Hotsy Equipment Co."
Hotsy Detergents don’t choke you out or make it hard for you to breathe while washing. The detergents are user friendly. They’re strong enough to get the job done but don’t harm our equipment." Salt Lick works expressly well with heavily soiled equipment and vehicles. The product also works very well on automotive finishes, effectively removing the residues from the winter roadways." I am very happy with the Reznor waste oil burner. It has, by far, surpassed my expectations." Salt Lick works really well. It does a great job removing road film and the application is incredibly easy to apply with our Hotsy." We're happy Hotsy Equipment Co. is close by. We like to have our machines serviced annually and if anything else comes up, you guys are out and take great care of us." If we do have an issue, Hotsy Equipment Co. is very prompt to get us the help or service we require." Bugs have never been easier to get off of my vehicles than when I pressure wash with Hotsy’s Power-Shine." 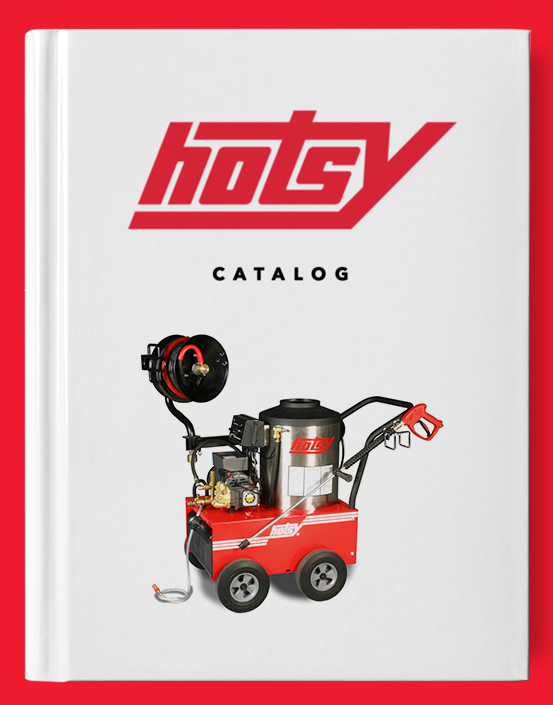 The team at Hotsy Equipment Co. is always knowledgeable when it comes to the parts we need for our pressure washer. They always have what we’re looking for." We rely on Hotsy Equipment Co. to service our machine annually. We leave it to Hotsy and haven’t had any trouble with our machine." We’ve been using Hotsy’s for over 25 years. We use ours close to 12 hours a day. Hotsy Pressure Washers are reliable and they work great." We use Power-Shine year round on stainless steel and aluminum. We rely on it in the winter to get the corrosive materials from the road off of our semis and trailers. Power-Shine works great!" We use the Hotsy detergents on my equipment and am pleased with their performance, keeping my trucks and trailers clean and looking good." Hotsy Equipment Co. has been very helpful and always takes care of our needs. Hotsy's service techs are always knowledgeable and do a great job getting us up and running in a timely fashion. Thanks for the great service." Copyright 2019 Hotsy Equipment Co.